In the mid 1800s, Frank Berry was a skilled and capable bricklayer. He helped build the Meridian City Hall, the courthouse, which is presently in use, the old city and county jails and many other local business buildings. He also worked on the court house in Livingston, Ala. Unfortunately, while Berry was working on the three-story Citizens Bank Building, the scaffolds collapsed and he fell to the ground sustaining a permanent crippling injury to his right leg. In 1882, he saw a need for a funeral home to give full-service to the black community. Prior to that time, black citizens had to go in and out of the back doors of white funeral homes with their loved ones. 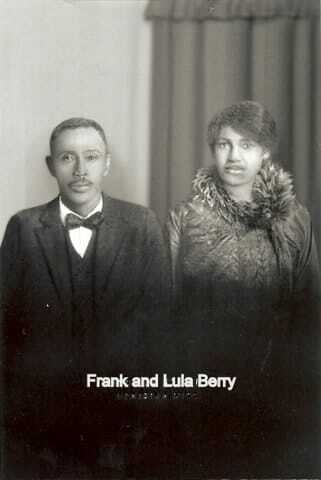 Thanks to Frank Berry, Blacks could proudly use the front doors and get proper service. 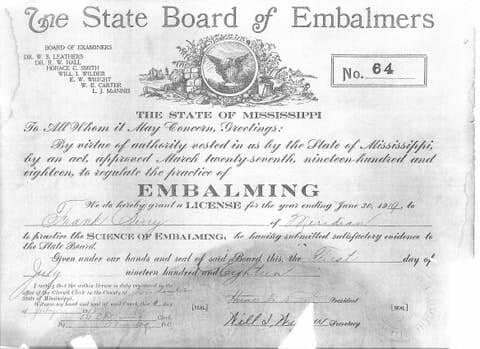 After Mississippi required a license to embalm, he became the first licensed black embalmer (copy of license #64 shown in gallery) and established the first black funeral home at 2513 Fifth Street in downtown Meridian, Miss. During the "Great Depression", Frank Berry served many families for little or no compensation. He provided many with money, food and free rent. He also provided a means for many students to attend school to further their education. In an era when racial harassment was prevalent, Berry also posted bond for many blacks who had been jailed. 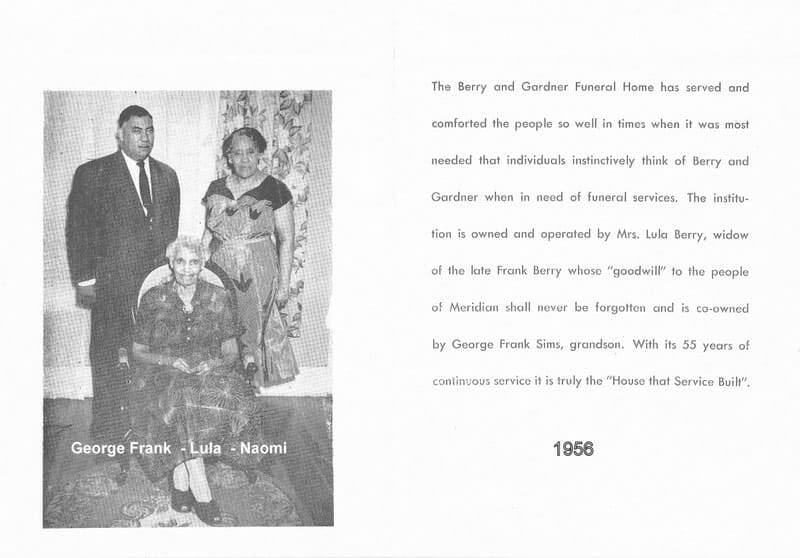 An article printed in the Citizens of Color Newspaper Progress Report (1831 - 1962) by John Barksdale, highlighted Berry & Gardner Funeral Home. In the publication, Barksdale cited an account of Berry and Gardner's interesting history. 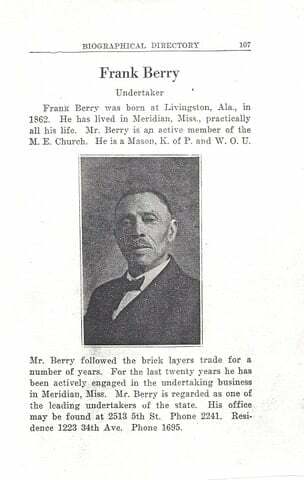 In March of 1882, Henry Strayhorn, Sr. and Frank Berry, prominent Meridian brick layers, established Strayhorn & Berry Funeral Home, employing Reverend E.H. Gaston as manager. George Gardner, a blacksmith ,bought one-third ownership with Strayhorn and Berry, adding his name to the firm. It operated under the name of Strayhorn, Berry and Gardner until Strayhorn Jr. went into business for himself in 1901. Up to that time, Berry served as president, Strayhorn as Treasurer and Gardner as Secretary. It was chartered under the firm name of Berry & Gardner upon Strayhorn's departure. After several years of pioneering, Frank Berry took over management and served in this capacity until his death in 1940. This left his wife Lula Cotton Berry, Kate Gardner and daughter Naomi Louise Sims to run the business, along with Saul Ruffin as manager and two young helpers, Danny Earl Clay and Joe Raymond. George W. Sims, born in 1888, became a licensed embalmer in 1920. He married Naomi Berry and worked in many roles supporting the Berry and Gardner operations. His involvement in the business, included embalming, funeral directing and working as the substitute preacher. 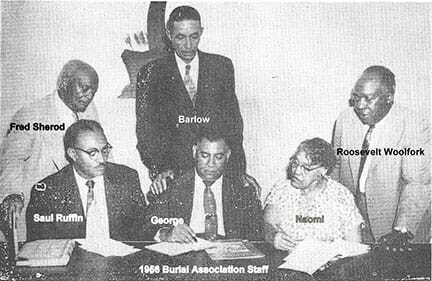 Their marriage was blessed with two sons, George Frank Sims and Louis Berry Sims and one daughter, Naomi Ruth Sims. They later divorced and he left Meridian to settle in Columbus, Miss., working at Sykes Funeral Home. After his son George Frank took over the day-to-day operations, he was asked to return to assist. George W. Sims remained active at Berry and Gardner until his death in 1983. The funeral home continued to operate with Lula and daughter Naomi running the business. This became a very tough endeavor for two aging ladies to manage alone. George Frank had left Meridian to pursue a music career. As the eldest son and grandson of Frank Berry, his mother Naomi L. Sims asked him to return home to assist in running the funeral home, which he did in 1942. 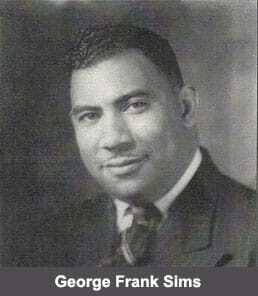 George Frank Sims was an honor graduate of Washington University in St. Louis, earning a degree in Mortuary Science. He was also a skilled musician, specializing in the trumpet and played with Ringling Bros. and Barnum & Bailey Circus. He played the jazz circuit in many local and famous national bands. The business outgrew the facility on 5th Street. George Frank Sims was a licensed mortician and a shrewd businessman. His most brilliant foresight was to erect a state-of-the-art modern facility. The firm moved from the 5th street address on August 17, 1957 into a new building at 1300 34th Ave. (now George F. Sims Ave.), the present location. In 1959, Kate Gardner, widow of George Gardner, sold her interest to George Frank Sims. With that event, it then became a one-family-owned business. Berry and Gardner expanded operations to Quitman, Miss. On September 18, 1972, construction on a new funeral home was begun at 305 Lynda St. This facility was completed in April of 1973. On May 10, 1973, this location had the grand opening with Charles Goodwin and Carl Jeff Brooks managing. This additional location provided the Quitman citizens and surrounding communities the same convenient first-class services offered at the Meridian funeral home. Naomi Louise Sims died in 1978, leaving her shares to her three children, George Frank, Naomi Ruth and Louis Berry Sims. George Frank’s brother and sister lived out of town and were unable to actively participate in the operations of the business. 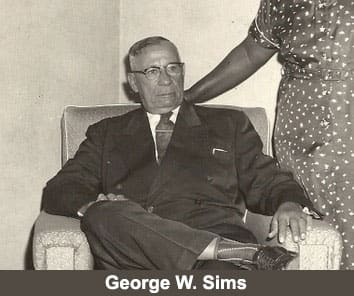 Naomi Ruth’s son, George Henry Clay, worked in the business with his Granddad, George W. Sims, assisting with general duties. His experiences while growing up in the business provided background and inspiration for a successful career in insurance. George Frank’s health began to decline so he asked his stepson Robert Kennedy to move back to Meridian in 1979 from Los Angeles, Calif. to assist in the operation. George Frank died in 1986 leaving his spouse, Ulpiana P. Sims, his ownership. 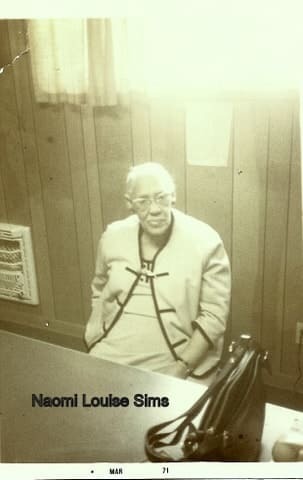 Ulpiana P. Sims acquired the remaining shares from Naomi Ruth Sims and Louis Berry Sims’ family, making her sole owner. She retired from teaching to devote full time time to the funeral home operation. 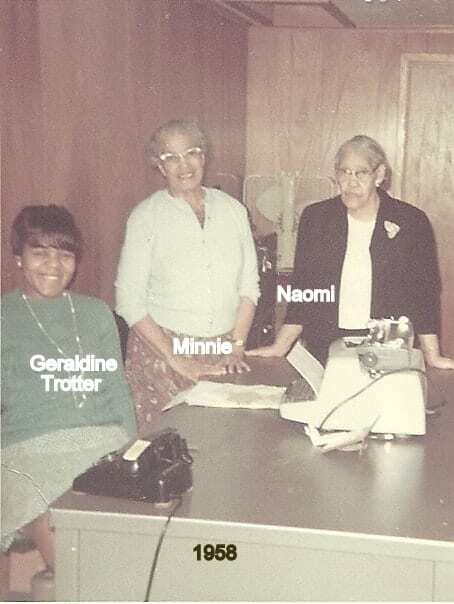 Ulpiana Pacio Kennedy-Sims served as President along with her son Robert Kennedy as General Manager and her daughter, Esperanza Kennedy Sullins, served as Assistant Manager. They were step children of George Frank. 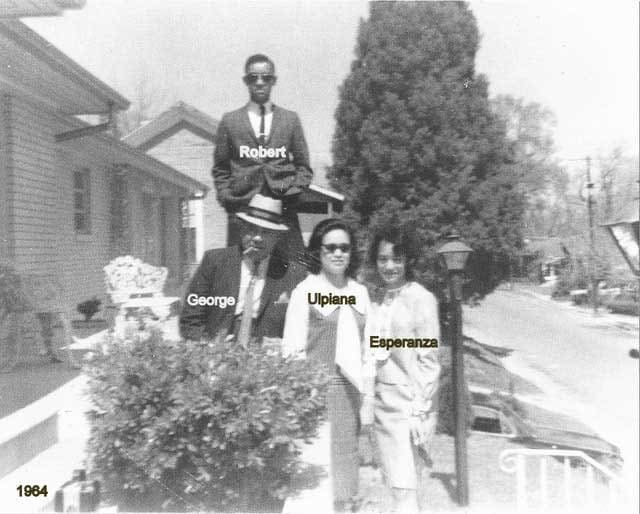 Esperanza earned a Funeral Service Degree from Delgado Community College in New Orleans and was licensed in Mortuary Science in 1991. She actively works in the business and her husband Palmer serves as a Board Advisor. Their son Jonathan actively worked in the business as the Management Assistant. Over the history of the funeral home, many contributed to the success of the firm. They included Saul Ruffin, Gertrude Lucas Coleman-Churchman (granddaughter of Frank Berry), Joe Raymond, Danny Earl Clay, Ellis Washington, Rogers Reese, Reverend M.C. Thompson, Leon Drake, Jessie Sims, Bowen Gaddis, Geraldine Trotter, Charles Goodwin, Carl Jeff Brooks, Otis Bland, Barry Slay, Gordon Greenwood, Willie Wade, Keith Dean, Kenneth Jones, Tony Jennings, Edward E. Gibson, Margie Norman, Sam Bell and many others. 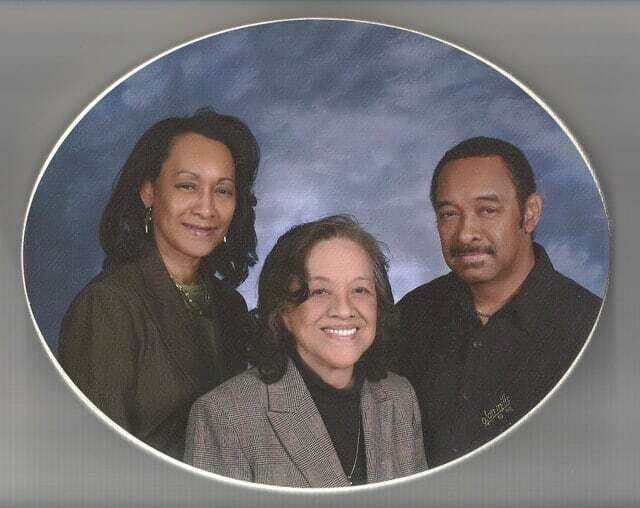 On August 4, 2010 in Ft. Lauderdale, Fla., the Hundred Black Women of Funeral Service inducted Berry and Gardner Funeral Home into the African American Funeral Home Hall of Fame and was awarded an induction trophy as well as a letter of recognition from the Congress of the United States. Berry and Gardner was also honored with a lead crystal trophy in recognition of being the oldest Black funeral home in Mississippi and one of the oldest in the nation. Other awards include Mississippi Funeral Directors and Morticians Association Osborne Bell Award, Meridian Star Reader's Choice Award, the Family Life Insurance Insurance Agency Top 5 Producers Award and the City of Meridian Parks and Recreation. On January 9, 2014, Ulpiana Pacio Sims made her transition to heaven. May she rest in peace. Her son, Robert Kennedy Jr., assumed her position as President and CEO. On May 12, 2015, Jonathan C. Sullins, son of Esperanza and Palmer Sullins passed. He spent 10 years serving as Cemetery Technician and Rolling Stock Manager.